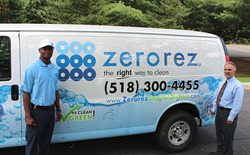 Zerorez®, a national carpet and living surfaces cleaning franchisor, continues its Northeastern wave of growth, following recent introductions into Pennsylvania (Pittsburgh area) and Massachusetts (Springfield area) with its patent-pending and “green” cleaning system. Superior cleaning results and strong franchise owners are key to the brand’s continuing success. Over the past four centuries, Albany, NY has grown from a small Dutch settlement into New York State’s Capital Region in the heart of burgeoning Tech Valley. Now, the area is also home to the Zerorez Capital District Franchise. New York State Industries for the Disabled, Inc. (NYSID), based in Albany, is the Zerorez Franchisee for this area, through its wholly owned subsidiary Choice Work, LLC. NYSID has been turning business opportunities into jobs for New Yorkers with disabilities since 1975. It makes gainful employment possible for this dedicated and highly qualified workforce through New York State’s Preferred Source Program. Annually, NYSID is responsible for nearly 7,000 jobs, giving dignity and sense of purpose to a diversified group of New Yorkers. “Throughout 40 years of operation, NYSID has introduced new employment choices, such as document imaging and electronics recycling, so that New Yorkers with disabilities have a choice of job opportunities that complement their work skills and potential for independence. Zerorez is another step forward in sustaining livelihoods for those who work on NYSID contracts. We see it as a social enterprise model for our member agencies, who need to create independent funding sources while meeting the social purpose of providing training, employment and a better quality of life to New Yorkers with disabilities,” said Ronald P. Romano, President and CEO of NYSID. “Zerorez was chosen after careful evaluation of over 50 different franchise opportunities. It became clear during our review process that it was not only a company with a similar social mission/conscience, but also offered a radical advancement in an industry that hadn’t changed in over 50 years,” said Romano. “The biggest difference we have found (outside the patent-pending technological improvements) is Zerorez’s people and the culture. There is a true dedication not to just the service provided but also to the customers themselves. There is a core value of service, that in a very real way permeates the entire organization,” added Romano. “ This Zerorez Venture will be supported by NYSID management and staff, combining many years of marketing, financial and business operations acumen. We’re excited to diversify into a new pathway of employment and pave the way for our state-wide membership.” We anticipate that the advancement of technology and service level will be a distinguishing feature within the community. As well, we envision expansion across New York State as an opportunity for our membership to become owners who are engaged in this brand,” said Romano. The Zerorez concept was launched in 2001. Based on its Powered Water® cleaning system, the founders intended to fundamentally change the carpet and living surfaces cleaning industry. Their answer was a comprehensive process using Powered Water, which is electrolyzed and oxidized to create a powerful cleaning solution without harmful toxins, soaps or detergents. Their research found that other cleaning processes leave dirt-attracting residue, which naturally leads to re-soiling, so they fail to truly provide a lasting clean. Zerorez Franchising Systems, Inc. has its corporate offices in metro Salt Lake City, UT and has coast-to coast operations currently in 25 states. In recognition of its cleaning efficacy, the Carpet and Rug Institute (CRI) has given Zerorez a Platinum Rating the industry's highest rating. See http://www.zerorez.com for more information and to contact the corporate office.